There was a time when I was a big John Waters fan, especially in high school and college. My favorites included Polyester and Pink Flamingos… and this one, which I watched several times on a VHS copy. And when I revisited his films on DVD about 15 years ago, I felt that I had “grown out” of Waters. I felt that he was amusing but that his reliance on shock value (“Shock Value” being the very title of his autobiography) and I was into Much More Serious Things. But recently, my girlfriend told me that this was one of her favorite movies. I realized that I had some dormant affection for Waters, and Hairspray in particular. I was inspired to buy the Blu-Ray. Boy, am I glad I did. What an absolute delight this movie is. To some fans, it was the beginning of the end for Waters, a “sell-out” picture that toned down the bad taste in a bid for mainstream acceptance. For me, it’s a perfect blend of Waters’s brand of off-color humor and good old-fashioned movie magic. And while it doesn’t feature anyone eating dog poop, it’s still plenty subversive, even today. Because how many films can you think of that have such wonderfully fat-positive messages? Even the most popular or respected fat actors often have their weight be a sign of character weakness, or held up for ridicule. Not here. 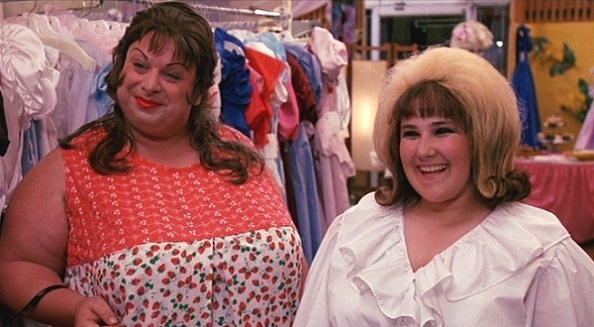 Tracy Turnblad (played with gleeful exuberance, winning charm and endearing naiveté by Ricki Lake) is pure heroine. The only people who sneer at her size are the most blatantly wrong-headed characters in the movie, the Von Tussle clan (more terrific casting in Colleen Fitzpatrick, Debbie Harry and Sonny Bono). Everyone else accepts her with open arms. What other movies were so lovingly fat-positive before this? Bagdad Café and maybe, if you’re being generous, Marty? And it had been so long since I’d seen this movie that I’d actually forgotten it’s more about integration than Tracy. Not that 60’s segregation was a particularly radical topic in 1988, but Waters handles it really beautifully. Not with subtlety — that wouldn’t be his style at all — but with a lot of heart and humor and honesty. And let’s give Waters a little credit… there is a subtle touch in how he displays even Tracy’s mild racism in an ignorant but well-intentioned line like “I wish I had dark skin!” Or when she indulges in a bit of “racial tourism” (my girlfriend’s term, I’m stealing it) in the black neighborhood, oohing and aahing at simple tenements. What don’t I like about this movie? Well, I always thought that Tracy and Link would never be enjoying the rides at Tilted Acres while her friends are outside demonstrating… but I understand they have to be there for the story to go where it needs to go. Other than that, I honestly can’t think of anything. It’s a great goddamn movie. It’s joyous and infectious, highly quotable, has wonderful dancing and a killer soundtrack. It’s bright and colorful and moves like a bullet train. Divine is amazing as always, although I almost hate to single her out when all the casting is so inspired. The movie is wickedly funny and smart and lovable. You just want to hug it. This entry was posted on March 29, 2014 at 11:14 pm	and is filed under Movie Reviews. You can follow any responses to this entry through the RSS 2.0 feed. You can leave a response, or trackback from your own site.